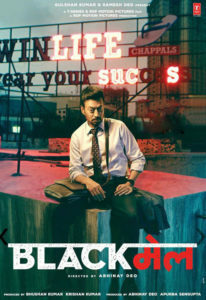 In the strikingly shot (by cinematographer Jay Oza) opening we see Irrfan struggling to stay afloat through his office hours, fighting shy of going home because the spark has gone from his marriage and wife who watches cheesy song sequences on television to while away her time. Actually it was never there, the spark I mean. In a wedding song that comes on at the end of the film taken from Irrfan’s Dev’s marriage to Reena (Kirti Kulhari) seven years earlier, we see how mismatched and ill-at-ease the couple was. This is a marriage where adultery is waiting to happen. And it does sooner than we expect. The takeoff point for the comedy is so steeply damning and done in the film with such humorous indulgence that we left pretty dazed by the absurdity of it all. From the adulterous episode Blackmail builds into an edifice of outrageous eventualities all bursting at the seams but never getting out of control, such is the director Abhinay Deo’s control over his characters, all victims of a scam that boggles the mind, tickles the senses and sets our imagination on the wildest wackiest ride since Abhinay Deo’s Delhi Belly. While the writing sparkles with a roguish splendor, and the director fills the frames with a fiendish glee – the narrative does spark off a distant pensiveness in indicating the breach of modern urban marriages. While Irrfan’s marital bedroom is shattered by Arundoy’s presence, Arunodoy’s own marriage with the bully wife played with splendid spleen by Divya Dutta, is no laughing matter. She treats him like her dog. He doesn’t mind as long as his monthly allowance keeps coming. Arunodoy sets aside his ego to make the husband a henpecked gold-digger. Arunodoy and Dutta are a riot together. Watching these two underrated actors imbue life and zest into their parts is a major part of the pleasure derived in viewing this bitterly dark comedy. Other exceptionally persuasive performances come from Praduman Singh as Irrfan’s shifty cheesy office colleague and Anuja Sathe as a timid office co-worker who transforms into an avaricious money monster in no time at all. Every actor gets the point. Blackmail is a film that celebrates the sheer lunacy of the marital equation when pushed against betrayal. Its strength lies in generating laughter out of the most meditative mishaps of marriage. The sheer preposterousness of making adultery into an occasion of a serial blackmail is used to invoke a sense of unabashed boisterousness. Blackmail is a virgin territory in the comedy genre. It is heady and hedonistic, cocky and compelling in the way the comedies of Hrishikesh Mukherjee and Basu Chatterjee used to be. If only these veterans could see the sexiness that underlines all gender wars. Blackmail is a closeted Hrishikesh Mukherjee comedy with oodles of extra voluptuousness.